Time to Buy Those Tickets! We are now about 45 days from our 50th class reunion to be held June 9th from 2:00-8:00 PM at Warwick Country Club. 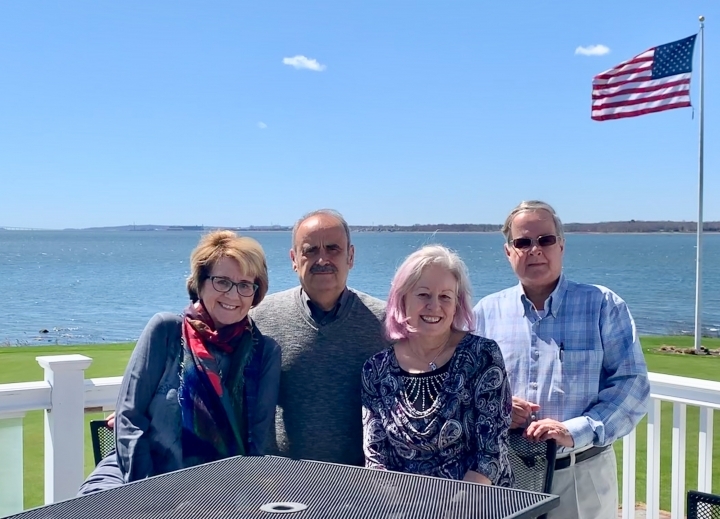 We anticipate sharing fond memories while relaxing together on beautiful Narragansett Bay (see photo from our April meeting). Our agenda includes appetizers by a welcoming piano bar (2-4 pm) followed by a dinner buffet (4-6 pm) and a “light rock” band guaranteed not to drown us out. We’ll invite you to publicly reminisce during our evening “open mike” festivities and, of course, you can dance just as at our “Sunrise, Sunset” Senior Prom—Incidentally, the sunsets over the bay at Warwick Country Club are spectacular! Please help to get as many classmates as possible to our reunion. Spread the word and offer to drive or Uber together! Now is the time to buy your tickets for $69 per person, as the price will rise to $80 after May 7. We have three payment methods: (1) use PayPal by sending a transfer to PilgrimHS1969@gmail.com (choose “sending to a friend”), (2) use the AlumniClass member site, or (3) send a check payable to “Pilgrim High School Class of 1969” to Ernie Valliere at 143 Sprague Ave. Warwick, RI 02889. Also, please notify us of deceased classmates for the memorial observance. Send photos of you, your family, pets, your artistic creations, and any noteworthy info to Ernie’s home address or to epv1223@yahoo.com. Heck, did anyone restore a ‘69 GTO? Ron Stetson—love those FB biker photos! Be sure to include relevant info and comments for our video presentation highlighting our Class of ‘69 classmates then and now. Shameless bragging is encouraged! Your Committee: Doug, Elaine, Ernie, Janice, Mary, and Nancy. The hotel name has changed from the Sheraton. Now it is the Wyndham Providence Airport Hotel, Post Road, Warwick. Phone 401) 384-0987. Group rates available for PILGRIM 50TH REUNION. Hi. Does anyone remember Bobby McGowan? The class of 1969 experienced history on a regular basis: The Summer of Love, the Tet Offensive, Nixon's rise to power, The Beatles' creative peak... very few spans of time can claim to have shaped American culture as much as the late 60's, and you & your Pilgrim High School classmates experienced it together. Now as you and your fellow Patriots prepare to enjoy retirement it's the perfect time to reunite and share where life has brought you in the last five decades. Your reunion is scheduled and AlumniClass is your spot for arranging travel plans, ordering custom Patriots merchandise to show off your school spirit, and connect with classmates ahead of time.